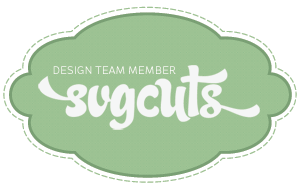 I'm so happy to be able to share another one of my SVGCuts DT projects with you today. 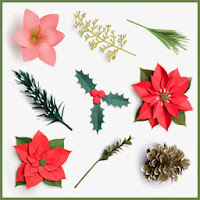 As I mentioned before, I just LOVE everything about Christmas. Needless to say, decorating the table is one of my favourite things. 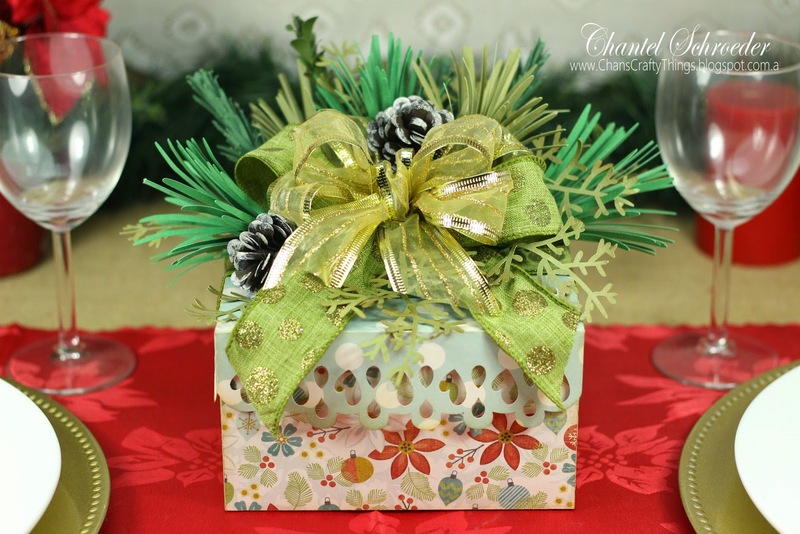 I started with a basic box (from the Christmas Gift Bags and Boxes SVG Kit) and tied a big bow around it. 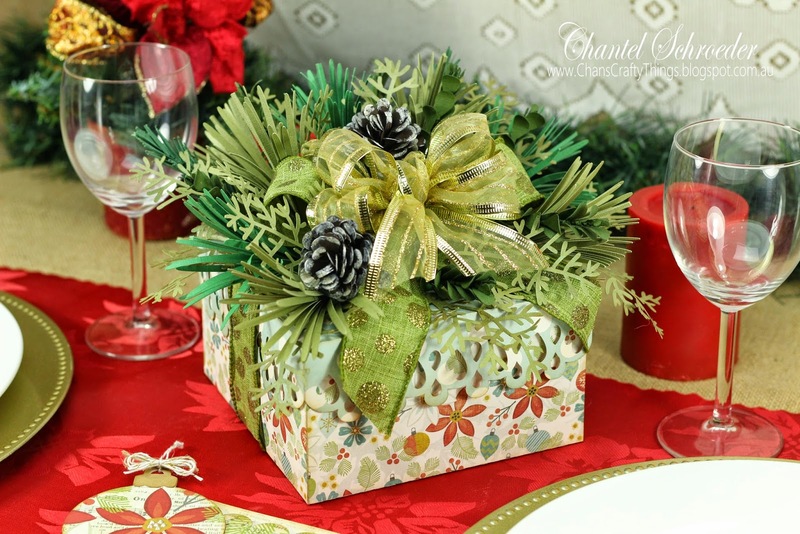 I then arranged a whole bunch of pinecones and wintergreens from the 3D Wintergreens SVG Kit on top. For measurements and full details on how I made it, feel free to pop over to the SVGCuts blog and read my post. 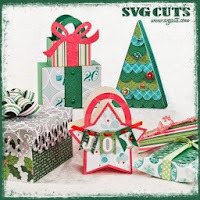 If you would like to win a copy of all the files needed to create this invitation, be sure to head over the SVGCuts Facebook page and leave a "comment" and "like" where they shared this project. Remember, it's for a limited time only, so hurry on over! In the meantime, here are some more photo's. This one is a front view of the bouquet. I've had this ribbon in my stash for ages and was waiting for the perfect occasion to use it. Well, I think I found it, lol! Isn't it pretty? 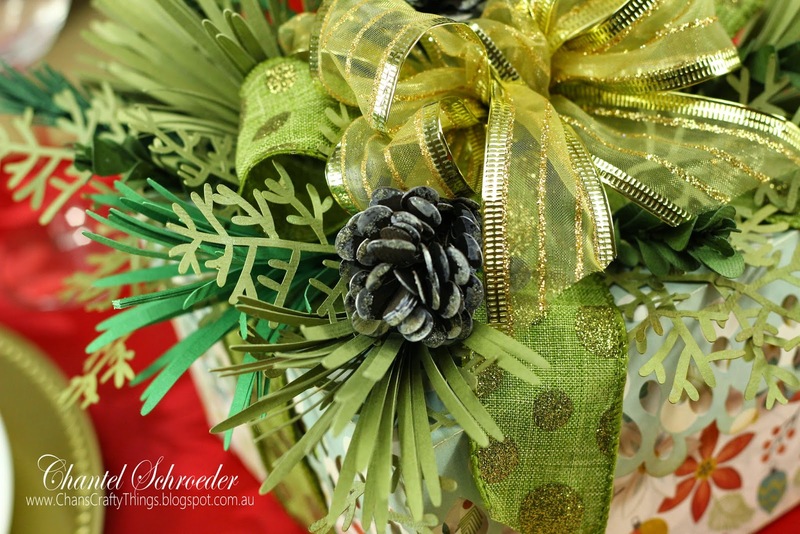 And here's a close up from the side... Those pinecones still amaze me - they're so easy to do and look so real! Mary did such a great job in designing them! This must be one of my favourite projects yet. Whilst the wintergreens took quite some time to complete (as I made heaps of them to ensure the bouquet was nice and full), I found it quite therapeutic in a way. The best part was when I finally got to the arranging stage - it was so rewarding to see the end result! I really hope that you've enjoyed this project as much as I've enjoyed making it. I also really hope that you will make one of your own. 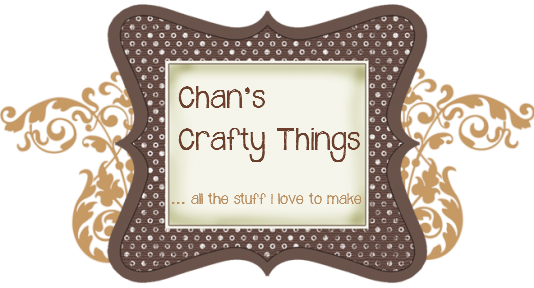 Don't forget to share your creation on my Facebook page - I would love to see your take on it!